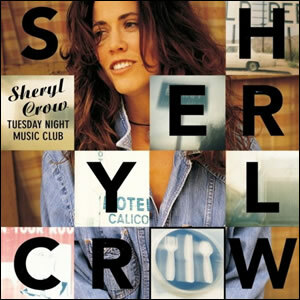 Sheryl Crow‘s official debut was at once brilliant and controversial. In fact, the title Tuesday Night Music Club comes from the assembled studio group who composed and recorded the album together with Crow at the forefront and guitarist Bill Bottrell as producer. However, only Crow was signed to the big record deal and she soon inflamed the situation by not stating accurate songwriting facts in post-fame interviews, a practice that was publicly denounced by Bottrell and other group members. Still, it is hard to dispute that the music is original, entertaining, and interesting and this is the criteria we use when selecting our Classic Rock Review Album of the Year. Crow was a former music teacher from Missouri, who started gigging with bands on the weekends. She also began recording jingles at a local studio and her voice was featured in many national commercials in the late 1980s. She later toured with Michael Jackson as a backup vocalist during his world tour 1987-1989 and got several session gigs as a backup singer with several established artists such as Stevie Wonder, Belinda Carlisle and Don Henley. Crow was signed to A&M and attempted a debut album in 1992, but convinced the label not to release the album because she was dissatisfied with the result. While Crow was dating Multi-instrumentalist Kevin Gilbert, she began jamming with his ad hoc group of composers known as the “Tuesday Music Club” at Ricketts’ studio. This rapidly developed into a vehicle for Crow’s next attempt at a debut album. After the release and success of the album, Crow’s relationship with Gilbert and the rest of the group became acrimonious due to disputes about songwriting credits, of which Crow was given a disproportionate share of royalties. Kevin Gilbert was killed in 1996, which pretty much cemented the rift between Crow and the rest of the Tuesday Night Music Club. The album begins with the soulful and steady “Run, Baby, Run”, a unique opener opener of revival blues that never picks up the pace and never really made much waves when it was released as the lead singer. Still, it sets up the following “Leaving Las Vegas” finely. Co-written by guitarist David Baerwald who borrowed the title from a book written by his friend John O’Brien, “Leaving Las Vegas” is the first track to contain the unique percussive effect, featured throughout the album. With a slow riff throughout played in different instrumental variations and topped by strummed acoustic and dynamic vocals, the song became a minor hit but indelible landmark on this album. However, this song also had its share of controversy as Crow stated that the song was “autobiographical” during an appearance on the David Letterman Show, which infuriated Baerwald and the rest of the group, especially when O’Brien committed suicide soon after. Two other songs early in the album went on to have chart success. “Strong Enough” is a very melodic and moody acoustic folk song with a potpourri of great ethnic instrumentation including organ, mandolin, and accordion. The song charted at No. 5 on the Billboard charts. “Can’t Cry Anymore” is built on the choppy strumming by Bottrell and strong chorus and bridge hooks by Crow. This Top 40 tune also has some well placed, subtle lead guitar riffs throughout. The biggest hit on the album and the song which brought Tuesday Night Music Club widespread attention is “All I Wanna Do”. The lyrics are based on the poem “Fun” by Wyn Cooper from his 1987 book The Country of Here Below. Musically, the song is dominated Gilbert’s bouncy bass and the pedal steel by Bottrell which gives the song a sonic vibe somewhere between “Stuck In the Middle With You” and “The Rain Song” (both from 1973). The song reached number two on the charts and was the winner of the 1995 Grammy Record of the Year. “Solidify” is an attempt at funk/disco, not all that terrible, but definitely a tangent song. “No One Said It Would Be Easy” borrows from the sound Neil Young put for the on Harvest Moon (the Classic Rock Review album of the year from the previous year, 1992), with a very calm and deliberate, almost too slow approach and dreamy lead guitar. and the emotional charge Crows invests in a song about trying to salvage a troubled relationship. Baerwald’s “What I Can Do For You” is a decent slow rocker containing a thumping rhythm by bassist Dan Schwartz and high-register vocals by Crow during the choruses. The album does contain a few weak spots, with the nadir being the rap filler “The Na-Na Song”. “We Do What We Can” is a nightclub cabaret blues with cheap electronic drums keeping a simple, slow rock beat. The album does end strong with “I Shall Believe”, which uses its title cleverly to work into an unusual perspective. It continues the “Strong Enough” theme of “don’t give up on me” and contains a restrained and laid back lead by Bottrell. Tuesday Night Music Club went on to sell more than 7 million copies worldwide and won three Grammy awards in 1995. Although it launched a highly successful career for Sheryl Crow, she never again quite found the band chemistry as with the ad hoc group who met in Bottrell’s studio on Tuesday nights. Part of Classic Rock Review’s celebration of the 20th anniversary of 1993 albums.